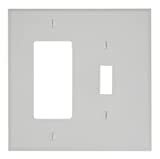 Interested in the Leviton PJ126-W 2-Gang 1-Toggle 1-Decora/GFCI Combination Wallplate, Midway Size, White? Is the price too high? You can easily price watch this product and we'll notify you when the price reaches your target.